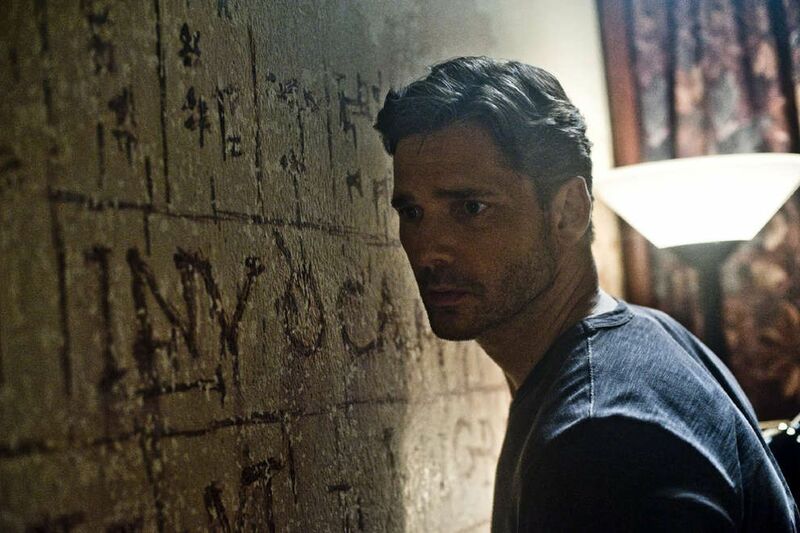 A baffled Sarchie (Eric Bana) studies wall markings as he tries to explain the strange sounds he hears in "Deliver Us From Evil." When it comes to demonic possession flicks - and there's no shortage - Deliver Us From Evil is something of an anomaly. An unholy marriage of The Exorcist and Law & Order written and directed by demon-movie specialist Scott Derrickson (Hellraiser: Inferno, The Exorcism of Emily Rose), Deliver is an engaging, thoroughly enjoyable - and utterly forgettable - police procedural about a South Bronx detective who discovers that a series of horrific crimes were perpetrated by a dastardly demon brought back from the Iraqi desert by a hapless American soldier. Like other entries of its pulpish ilk, the picture packs lots of violence, a fair bit of gore, and plenty of cheap scares. But it's also disarmingly classy, almost respectable. Derrickson - whose last demonological creepfest, the fun but also forgettable class act Sinister, starred Ethan Hawke and James Ransone - here is blessed with a roster of top talent led by Eric Bana (Munich) as police sergeant-turned-demonologist Ralph Sarchie, Olivia Munn (Newsroom) as his wife, and Édgar Ramírez (Carlos) as his spiritual adviser. We even get comic Joel McHale (E! 's The Soup, Community) as Sarchie's wisecracking partner, Butler. To top things off, the demonically possessed killer hunted by Sarchie is played by Sean Harris, who transfixed viewers as the cold-blooded assassin Micheletto in The Borgias. Deliver Us From Evil is marketed as a true story: It is loosely based on the 2001 memoir of the real-life Ralph Sarchie, a former cop who, with the guidance of a Jesuit priest and exorcism expert, came to believe in the existence of demons. Ramírez is really - really - earnest and awfully serious in the role of the priest, a former heroin addict who helps Sarchie see the light. Or, in this case, the dark. Both are hard-drinkin' macho men, so it seems natural they'd team up to track down, capture, and exorcise the demon. Munn is totally wasted in a stock role as the absurdly patient wife who stands by her man as he goes off demon- hunting. Deliver Us From Evil moves at a brisk pace, thanks to Derrickson's efficient - if demonically formulaic - script. Going to this movie is a lot like buying a fast-food burger. You know exactly what's in it, how it's prepared, how much it costs, and what it'll taste like. Though to be fair, this isn't a $3.79 Quarter Pounder with cheese. It's a classy $12.95 steak sandwich. But drown them both in lots of blood-red ketchup, and they pretty much taste the same. Directed by Scott Derrickson. With Eric Bana, Édgar Ramírez, Olivia Munn, Joel McHale, Sean Harris. Distributed by Screen Gems. Parent's guide: R (bloody violence, grisly images, terror throughout, and language).